Yorkshire Terriers are beautiful and elegant dogs that are loved by many. They are loving and full of life. They are known as lap dogs but there is a lot more to a Yorkie then cuddling with their owner. They can be very active and inquisitive little dogs who sometimes think they are much bigger than they really are. Yorkies are not the best choice for active and rambunctious children, but if your children are calmer and know how to interact with a small dog it can be a great match. The biggest fear with children and Yorkies is that the toy breeds can easily be seriously injured if you don’t know how to handle them. Yorkies can be yappy and hard to house train if you don’t start the training early. But overall a Yorkie is a wonderful, loving and active dog that can liven up anyone’s lives. To give a glimpse into life with a Yorkie I will share with you what life has been since our three year old, five pound Yorkie, Hua Mei (Chinese meaning Splendid Beauty) joined our family just seven months ago. I started training her straight away but she didn’t want anything to do with it. I would sit down with her with a lot of yummy treats ready to go and started simple with teaching “sit”. Well, she then would run away from me–this happened for quite awhile. Then one day she realized that training was fun and started learning all kinds of new things with me. Two months after joining our family we started Agility classes, she was scared at first but now loves it. When I was teaching her Weaves she would often go to the back door as if she wanted to go outside but instead I discovered she just wanted to work on her weave training. 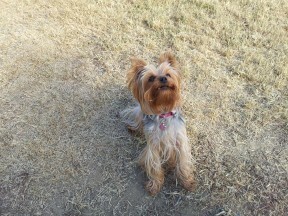 As I said before, often Yorkies are considered lap dogs, but not my Hua Mei until she gets a lot of playtime in first. If you don’t give her that she may start jumping up on the table or looking in rooms for something to play with. Sometimes she will pick out one of my daughter’s toys, if it’s within her reach she thinks it must be hers. 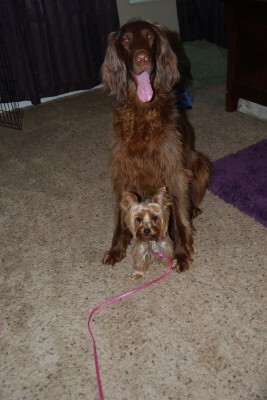 She keeps up with my Irish Setter, Maiyah, amazingly well. Hue Mei loves to tug, play fetch, and chase Maiyah around the yard. Despite their vast difference in size they make good companions for each other. Normally I wouldn’t recommend a 60 lb. dog with a 5 lb. Yorkie, but Maiyah is gentle with her and Hua Mei is definitely tough and knows how to keep Maiyah in line. I would say Hua Mei is much more of a bully then Maiyah could ever be. My daughter and Hua Mei get along really well together. Even though Kiana is only four years old, she is a natural with dogs and knows to be gentle with Hua Mei. However, it’s still important to always supervise children and pets together. Yorkies vary greatly in size, so be sure if you have small children that you are unsure about how they will be with a pet, either choose a different breed or a larger Yorkie within the breed. At the end of the day when it is time for us to settle in that’s when Hua Mei is ready to be a lap dog, as long as she got her much needed exercise and attention in during the day. She is an active, smart and lively dog that loves to cuddle, it’s a great combination in a wonderful dog. If you want to add a Yorkie to your life be sure to read as much as you can about the breed, talk to various breeders if you have the opportunity, and make sure you make a well informed decision because Yorkies are not right for everybody and just because they look so cute and cuddly doesn’t mean they will fit in your family dynamics. But they are an incredible breed worth finding out if they are the fit for you. Also consider checking out Yorkie rescues. Hua Mei brings a lot of life and love into our family and I am thankful to have her in our home. She is full of surprises and you just never know what she will come up with next. Great article on Yorkies. They really can do anything and do not realize how little they are. My Yorkie Rufus is king and rules over my much bigger cat Tiki. Love learning new things about Yorkies. Thanks for such an interesting article. Lov e the pix too. It is interesting that your Yorkie won’t sit on your lap until she has gotten play time. I guess little dogs need to get their energy out too! I’m going to have to keep this in mind when I pick out what breed of dog I want to get, because I would love the combination of playtime and cuddle time.